New York, NY (11/14/2011) - You don't see or hear of many top fighters calling out the name of Middleweight Champion Sergio "Maravilla" Martinez. 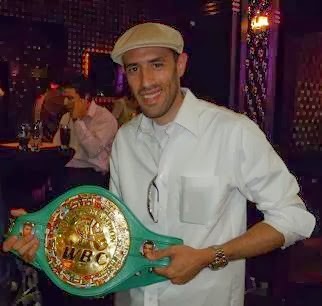 Martinez, the WBC Diamond belt Middleweight Champion, and 2010 "Fighter of the Year" is currently riding a four-fight win streak (W12 Kelly Pavlik, KO2 Paul Williams, TKO8 Serhiy Dzinziruk, TKO11 Darren Barker) that has seen him climb the pound-for-pound list, falling behind only Floyd Mayweather Jr. and Manny Pacquiao, both of whom have so far expressed no serious interest in facing Martinez. That being said it might come as a surprise to hear a fighter actually eager to enter the ring against Martinez, but that's exactly the case with Ireland's Matthew "Mack the Knife" Macklin. Macklin (28-3, 19KO's), the former European Champion, and WBA #4 rated middleweight in the world, is coming off a very impressive and entertaining showing on EPIX against "Super" WBA Middleweight Champion Felix Sturm, in which Sturm was awarded a highly controversial split decision in his home country of Germany, on June 25. Looking to further his career and secure another major fight in the middleweight division, Macklin signed with Lou DiBella's DiBella Entertainment, also the promoter of Martinez. After signing with Dibella, Macklin traveled stateside, setting himself up in New York City with a plan to stay through the remainder of 2011 and promote his name to the large Irish communities within the New York City area. "I'm enjoying life in New York. I felt it was important to move here so that I can build a fan base if I am going to fight here on a regular basis. I'm determined to give the city and the huge Irish community here a fighter to be proud of," said Macklin. Macklin realizes that Martinez is vying for a shot at the only two fighters ahead of him on the pound-for-pound list, but he feels that if those fights can't be made, a bout against him, in New York City, on St. Patrick's Day, is next biggest event out there. "I've proved throughout my career that the bigger the challenge and the bigger the stage the better I perform, and there's no bigger stage than fighting a guy considered to be among the top three pound-for-pound fighters in the world, in the Mecca of Boxing. Being in a massive world title fight at Madison Square Garden is the stuff every boxer dreams of and it's close to becoming a reality for me now. The fact that it will be on St. Patrick's Day is just the icing on the cake." While Macklin is by no means underestimating Martinez, he is extremely confident in his chances against the champ, especially after being on hand to witness Martinez' last fight in person. "I have a lot of respect for Martinez. What he's done after taking up boxing so late is remarkable, but he's really a natural light middleweight and I'm a big, strong middleweight. I believe that my size, strength and power will be too much for him. I think Darren Barker did better than people expected but I also think that Sergio underperformed that night. Maybe subconsciously he thought he was in for an easy night against Barker and wasn't at his best because of that. On that performance, he was lucky he wasn't in the ring with me because I would have knocked him out. He'll have to up his game tenfold if he wants to hear the final bell against me, but I would expect him to and I wouldn't want it any other way. I want to beat Sergio Martinez at his very best, with no excuses."